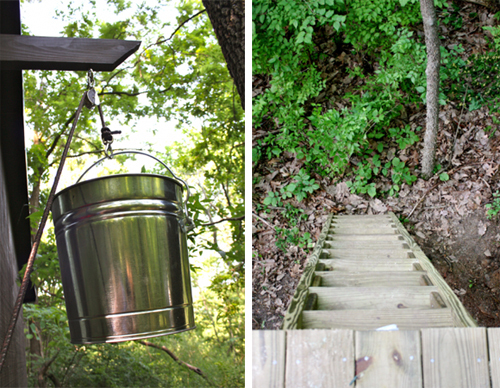 While perusing the ModFruGAL site, I came upon the blogger's fabulous treehouse that she and her husband built in Nashville, Tennessee. At just 8' x 8' (or just 64 square feet) this chill indoor/outdoor abode has a sleek, modern style built with a simple, one pitch roof. Inside, you'll find built-in rustic shelving throughout and two twin air mattresses which will allow room for four to sleep comfortably. All windows have a sliding, acrylic cover to help with the pollen in the spring, as well as keep the tiny space warm and cozy in the winter. Living simply takes thoughtful planning and a bit of work but it's pretty rewarding when you can pull it off as seamlessly as this. 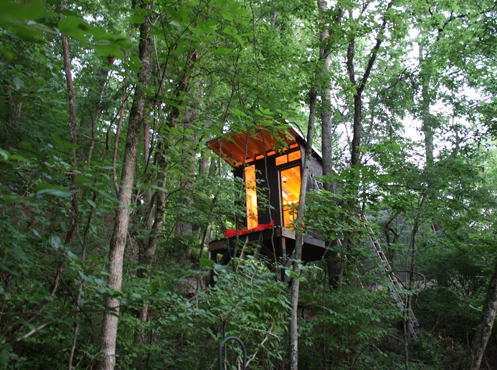 A tiny, modern treehouse retreat high in the sky...I want one.